The Galapagos Land Iguana resembles the mythical creatures of the past-dragons with long tails, clawed feet and spiny crests. Land Iguanas have a spiky dorsal crest which runs along the neck and back. They are heavily bodied with thick back legs and smaller front legs. Land Iguanas have a short blunt head and pleurodont teeth (Having the teeth attached by their sides to the inner side of the jaw, as in some lizards). Its tail is quite a bit longer than its trunk. In reality, these harmless lizards are alive today, but endangered in their own native land. There are two species of Land Iguana found in the Galapagos Islands – ‘Conolophus subcristatus’ is native to six islands, and ‘Conolophus pallidus’ is found only on the island of Santa Fe. Their yellowish-orange belly and brownish red back make them more colourful then their cousins the Marine Iguana. They measure over 1 metre (3 feet) long, with the male of the species weighing 13 kilograms. Land Iguanas live in the drier areas of the islands and in the mornings are found sprawled beneath the hot equatorial sun. However, to escape the heat of the midday sun, they seek the shade of cactus, rocks, trees or other vegetation. At night they sleep in burrows dug in the ground, to conserve their body heat. The Land Iguanas show a fascinating interaction with Darwin’s Finches, raising themselves off the ground and allowing the little birds to remove ticks. Land Iguanas feed mainly on low-growing plants and shrubs, such as the cactus, as well as fallen fruits and cactus pads, including the spines of the plants. These succulent plants provide them with both food and moisture they require during long, dry periods. Land Iguanas reach maturity between 8 and 15 years of age. Males are territorial and will aggressively defend specific areas, that typically include more than one female. Territorial displays involve rapid nodding of the head and sometimes, biting and tail-thrashing battles. Following the mating period, the female Iguanas migrate to suitable areas to nest, and will lay between 2 and 25 eggs in a burrow dug in the sandy soil. The female defends the burrow for a short time, to prevent other females from nesting in the same place. The young Iguanas hatch 3 – 4 months later and take about a week to dig their way out of the nest. 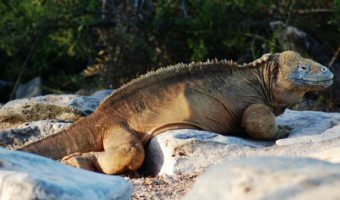 If they survive the first difficult years of life, when food is often scarce and predators are a danger, land Iguanas can live for more than 50 years. Part of the adaptation to the drier environment includes a conservation of energy by slow movement. This makes the animals seem lazy or stupid. Land Iguanas burrow into the ground creating tunnels which provides a place for nesting, shade during the day and protection at night. Charles Darwin visited Galapagos in 1835, he wrote about the abundance of the land iguanas. However, when whalers and settlers started visiting Galapagos in the early 1800’s, they brought with them goats, pigs, dogs, cats and other domestic animals. Over time these animals escaped or were abandoned with drastic results. Cats hunt the young iguanas and dogs kill adults. Goats wipe out entire areas of vegetation that the iguanas depend on for food. Today, the abundant iguanas that Darwin wrote about on Santiago Island are extinct. On some of the other islands they are nearly gone.